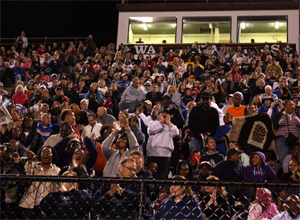 Every October, fans from across the Lowcountry converge on Charleston Southern for a full day of competition and fun at LCI – the Lowcountry Invitational Marching Band Festival. Every ticket sold comes with a complimentary program, so everyone in attendance gets a copy of your ad, and the regular breaks throughout the day provide plenty of time to read the entire program. The ticket sales – plus band members, chaperones, and volunteers – bode well for giving your business plenty of positive exposure. And Director-level sponsors receive recognition over the PA regularly throughout the day, and their representatives help present awards at the conclusion of the event. The Lowcountry Invitational Marching Band Festival sponsorship is your chance to support music in Charleston County and receive special recognition at this grand event within our community. This unique sponsorship helps fund over fifty percent of our annual budget to maintain our national award winning high school band curriculum. We promote each sponsor before and during this day‐long event. Your tax deductible donation is an investment for success – helping us achieve our musical goals, while you increase your local business exposure. Sign up today and be a part of this exciting win‐win community partnership (Click here for additional information and the LCI Program Advertisement Form). Your financial contribution will help sustain The Bands of Wando and promote your business – together, in perfect HARMONY!